← The Sports Archives – Can Gracie Win The Gold? The Sports Archives – What Science Has Taught Us About Improving Your Golf Swing! Watch enough ESPN, and you might begin to think that performance on the golf course is all about toting a bag full of name-brand golf clubs. While big name clubs often perform well, it’s actually the science behind the club—as well as the technique of your swing—that sends that little ball soaring toward the green. In fact, while golfers are putting time in at the local driving range perfecting swings, club manufacturers continue to perfect the physics of golf clubs. Technique is essential to a solid hit, but power and speed are also important. According to studies, air resistance—known as drag—on the club can reduce the power of a swing by up to 10 percent. Air is most resistant on the largest, flattest part of the club: the head. Subsequently, most club heads feature groves along the flat edge to allow for increased airflow. Drivers are also designed to improve airflow through aerodynamic shapes on the back of the driver head. Large club heads provide some benefits to overall swing and initial impact with the golf ball. Since a larger head will also increase drag—which could lead to up to a 15-yard reduction in how far the ball travels—companies must work to strike a balance between powerful heads and optimal airflow. A powerful swing with a non-flexible club doesn’t always translate into a beautiful, long arc of travel for the ball. If the club hits the ball with full force and no flexibility, simulations indicate that up to 99 percent of the force is lost. All that power abuses the golf ball but doesn’t result in increased performance. 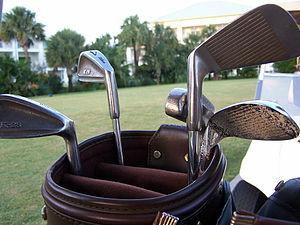 Modern golf clubs are designed with “spring” in the shaft. As the club reaches the peak of a swing, the weight of the head bends the shaft slightly. The bend is retained through the conclusion of the swing so that, when the club meets the ball, the swing isn’t 100 percent complete. The club springs back into place, adding additional motion and force to the swing and launching the golf ball into an arc. This is why titanium is used in modern club construction—it is extraordinarily strong but retains flexibility. The scientific concept behind the springy design of modern clubs is known as the Coefficient of Restitution. Understanding COR allowed club manufacturers to almost ignore drag while designing increasingly powerful clubs and drivers. Professional golf swings were becoming so powerful, current golf courses were in danger of becoming obsolete. Too many golfers were about to develop swings powerful enough to make it on the green of a Par 4 in one swing. To protect the sport, professional organizations set regulations regarding the type of clubs that could be used in tournaments. Professional golfers can only use clubs with a Coefficient of Restitution of 0.83 or less. Anything over that COR could increase performance by up to 10 percent. Players using “hot clubs” in PGA tournaments are penalized through forfeiture or bans. Katie Morris is a freelance writer with several years of experience writing in the science, sports and recreation fields. The Evolution of Golf Clubs! This entry was posted in Golf and tagged Coefficient of Restitution, espn, Golf Blogs, golf clubs, golf performance, golf swing, golf tips, how to reduce drag, performance enhancement, PGA penalties, science, sports and leisure, sports and recreation, Sports Archives, Sports Blogs, titanium golf clubs. Bookmark the permalink.